When NASA's newest rover, Curiosity, reaches Mars in about three weeks, it will not be the first to set its wheels on the Red Planet, but it will be the largest and most advanced robotic explorer that has ever been sent to our planetary neighbor. The Curiosity rover, also called the Mars Science Laboratory, was launched in late November 2011, and is expected to land on Mars on the night of Aug. 5 PDT (early Aug. 6 EDT). The $2.5 billion rover will touch down at Gale Crater, and is designed to search for clues that Mars could be now, or in the ancient past, a habitable planet for microbial life. NASA first set its sights on landing on the Red Planet in the 1970s. The agency achieved its first Mars landing in 1976 with the Viking 1 lander. Since then, the agency has had six spacecraft successfully touch down on the Martian surface. But with the impending arrival of Curiosity, NASA will showcase the most sophisticated Martian rover yet. "The Curiosity landing is the hardest NASA robotic mission ever attempted in the history of exploration of Mars, or any of our robot exploration," John Grunsfeld, associate administrator for NASA's Science Mission Directorate, said in a news briefing Monday (July 16) at the agency's headquarters in Washington, D.C.
For starters, the way Curiosity will lower itself to the surface of Mars in less than 20 days is unprecedented. The rover will use a new and complex sky crane system to slow its descent. Previous Mars rovers, such as the twin Spirit and Opportunity rovers (collectively known as the Mars Exploration Rovers), used airbags to cushion their landing. Spirit and Opportunity arrived at the Red Planet about three weeks apart in January 2004. Each rover weighs about 384 pounds (174 kilograms), but since Curiosity tips the scales at 1 ton, it was deemed too heavy and too large for an airbag-assisted landing. "The mass of Spirit and Opportunity was just about at the limit for what that airbag design could handle," McCuistion said. Spirit and Opportunity were designed for three-month missions on Mars, but both far outlived their warranties. After getting stuck in Martian sand and losing contact with Earth, Spirit was officially declared dead in May 2011. But, Opportunity is still alive and well, and is currently exploring a massive crater, called Endeavour. Since it landed on the Red Planet, Opportunity has logged an impressive 21.4 miles (34.4 km). Like its two predecessors, Curiosity will be equipped with six wheels with individual driver motors and a suspension system to help it drive up inclines and combat the difficult Martian terrain. But Curiosity will also be able to move faster, with 3.35 miles per hour (5.39 kilometers per hour) being its top speed on flat, hard ground. For comparison, Opportunity's maximum speed is approximately 0.1 miles per hour. Curiosity is designed to perform detailed analyses of Martian rocks and soil, including what lies beneath the surface. The rover is equipped with 10 different instruments that have a collective mass of 165 pounds (75 kilograms). Spirit and Opportunity each carried five instruments, totaling 11 pounds (5 kg). 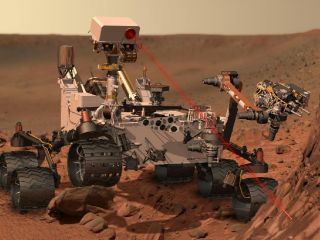 Curiosity will be able to dig, snap high-definition pictures of Mars, analyze chemical properties of soil and rock samples, study minerals, and even blast rocks with a laser to measure their chemical compositions. As one of the key indicators of potential habitability, Curiosity will investigate the presence of water around Gale Crater. "Over the last decade-and-a-half of exploration, we have found more water than expected," said Michael Meyer, lead scientist for NASA's Mars Program at NASA headquarters. "With the landing of Curiosity, the adventure begins as we explore the past and present of Gale Crater." As NASA prepares for Curiosity's nail-biting trip through the atmosphere of Mars, mission managers anticipate the huge rover will herald a new age of exploration on the Red Planet and beyond. "The Mars Exploration Program was designed to create steady progress in both technology and scientific capabilities at other planets," McCuistion said. "NASA was created to take on big challenges, and that's what this one is. MSL is forging ahead in greater and greater ways for science and for technology. Robert Kennedy said, 'Only those who dare to fail greatly can ever achieve greatly.' MSL is poised to do great things."